In any user centric application, we always strive to make application more interactive and user friendly. When ever user performs any heavy or lengthy operation (Uploading/downloading a large file or Installation) he or she expects to know the progress of operation at regular intervals. The user should be made aware of status whether it may be success or failure at each step. We cannot keep user waiting. 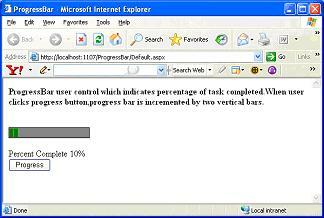 The user should be informed of percentage of task completed. This article discuss about the custom user control to create a smooth, incrementing ProgressBar control. It's typical user control which you can include in any of asp.net web application. This user control is a light weight which is built using a HTML table. <uc1:Progressbar ID="Progressbar1" runat="server" BGColor="Gray" Blocks="20" BorderColor="Black"
BorderSize="1" Cellpadding="1" CellSpacing="1" FillColor="Green" Height="20" Value="10"
From above HTML listing, you can observe that ProgressBar user control exposes many properties. You can use this properties to control the behavior of ProgressBar. BGColor: This property determines the Background color of ProgressBar user control. Default value for BGColor is Gray. You can configure BGColor of ProgressBar using this property. Blocks: This is an important property. Blocks will determine the number of vertical bars that will be displayed for each step. From the above HTML listing, you can observe that Blocks has value of 20. This value acts as a base value. Value Property and Block Property values are related using below given formulae which decide the number of vertical bars to be filled in bar at each step. Above figure should give fair idea how ProgressBar is filled at each step. Since, we used base value of 20; you can see that for each step, ProgressBar is incremented by two new Vertical bars. Border Color: This property determines the border color for the ProgressBar. Fill Color: Determines the color for Vertical bars. Cell spacing: Technically speaking, ProgressBar is a simple HTML table with Vertical Bars being the cells inside table. To maintain space between Table cells, we use this property. Remaining properties determine the appearance of HTML table element. You can download source code for ProgressBar. Now that we understand the working principle behind the user control. We will add this user control to our page as shown below. Caution, whenever we add any user control to any page, we should register it with the page as shown below. We have added few labels to display the status in numerical and readable format. As shown in above figure, you can see that when user clicks Progress button, ProgressBar will be incremented by Value property set for user control. Label2.Text = "The Progress is complete"
Label2.Text = ViewState.Item("PBValue").ToString() + "%"
And that is it, ProgressBar completed its work, and this tutorial too :).